Your diet plays a critical role in helping your body heal. Inflammation is part of our body’s natural immune response, the first line of defense in protecting our bodies from invading organisms that enter our system through wounds or by contact with viruses and bacteria. Inflammation tends to attack the weakest organ system first, depending on genetics and/or pre-existing health conditions. Fortunately, there is something we can do to reduce inflammation and help support our body’s healing process that does not require expensive drugs or surgery. Your diet plays a critical role in helping your body heal from inflammatory related diseases. By consciously selecting the foods you eat, you can better support your body’s healing process. The overconsumption of sugar creates an environment in your body that encourages inflammation, causing the immune system to become overactive. Consuming sugar in any of its forms (refined sugar, brown sugar, raw sugar, turbinado sugar, honey, maple syrup, corn sweetener, dextrose, glucose, fructose, barley malt, rice syrup, sugar cane, concentrated fruit juice, etc.) disrupts the acid/alkaline balance of pH in your body, triggering the release of inflammatory messengers. (Learn more about the importance of balancing your pH.) The American Western Diet is full of hidden sugars. The food industry uses its many different forms as key ingredients to improve flavor in processed foods. But it’s not just sugar, even refined carbohydrates, such as white and wheat flours, white rice, crackers, and cereals, when eaten create glucose in the body that contribute to the inflammatory response. If you are suffering from inflammation, it is critical that you learn how to read food labels and limit the amount of sugar and refined carbohydrates in your diet. It is very important to understand that both omega-6 (saturated fat) and omega-3 (unsaturated fat) fatty acids are essential in a healthy diet, as our body cannot produce them by itself and they are both integral parts of our cell membranes. However, our Western American Diet consists of an overload of Omega-6 essential fatty acids. According to the US National Library or Medicine, “human beings evolved on a diet with a ratio of omega-6 to omega-3 essential fatty acids (EFA) of approximately 1 whereas in Western diets the ratio is 15/1-16.7/1.” Lowering your ratio closer to 1:1 will reduce the risk of many chronic diseases. What happens when Omega-6 consumption significantly exceeds Omega-3? Our bodies become overloaded with arachidonic acid (the fat our body creates from Omega-6 fatty acids) causing the cell membranes to produce chemicals called cytokines that directly cause inflammation. It is important to understand that, although Omega-6 saturated fats are pro-inflammatory, when consumed in whole, unprocessed foods, such as coconut oil, palm oil, nuts and seeds, there is a natural balance of anti-inflammatory compounds that lessens, and sometimes even counters, the impact. In order to reduce the pro-inflammatory effects of a diet high in omega-6 fatty acids, it is important to reduce your consumption of highly processed foods (such as foods cooked or fried in vegetable oils and refined carbohydrates), meat, dairy, and wheat. Increase your consumption of Omega-3s (unsaturated fat). Include edamame, flax oil, walnuts, chia seeds, hemp, seaweed, mung beans, soy, tofu, cauliflower, brussel sprouts, and sea plants in your diet. Don’t forget your dark leafy greens. Although spinach, kale, collards, arugula, and romaine do not provide massive sources of fat, their ratio favors Omega-3. Eat whole-grains. Brown rice, amaranth, barley, buckwheat, bulgur faro, kamut, and wild rice all help to level the after-meal rise in blood sugar and insulin, and dampen cytokine production, thus lowering the inflammatory impact. However, this is not true for whole-wheat, which is highly pro-inflammatory. Cook with anti-inflammatory herbs and spices. 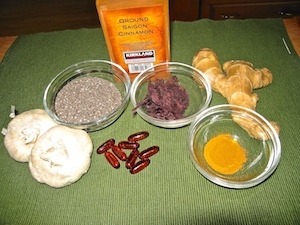 Flavor your food with rosemary, thyme, turmeric, oregano, garlic, cinnamon, and basil. Spice it up! Cayenne, serrano, and jalapeño contain capsaicin which inhibits the COX-2 enzyme, a known cause of inflammation in arthritis and other inflammatory diseases. Juice ginger with other veggies daily, add as a spice in your recipes, or drink in a tea. Ginger, consumed daily, not only blocks the formation of the inflammatory compounds–prostaglandins and leukotrienes–but also breaks down existing inflammation and acidity in the fluid within the joints. However, if you are taking any blood thinning medications, consult your doctor before including ginger in your diet as it has a blood thinning quality. Cook with extra virgin olive oil. The compound oleocanthal found in olive oil actually prevents the production of pro-inflammatory enzymes (similar to aspirin and Ibruprofen). Include these anti-inflammatory foods in your diet: almonds, walnuts, colorful bell peppers, tomatoes, sweet potatoes, strawberries, blueberries, cherries, and oranges. Also important are onions and apple skins which contain quercetin, a natural histamine inhibitor that helps the body fight environmental allergies, a common cause of inflammation. And don’t forget fresh pineapple which contains bromelain that suppresses inflammation and pain in the body by minimizing swelling. Reminder: It’s important to consult your doctor prior to adapting your diet as a means to reduce inflammation. What you eat not only affects your health, but also any medications you are taking. As your body begins to respond to the healthy nutrients, your doctor may need to adjust your medications. Having a professional monitor your progress will ensure that your body is getting the best support it needs towards perfect health. Yale Journal of biology and medicine, Why cancer and inflammation? This entry was posted in Nutrition, Plant-based, Vegan, Whole food, plant-based and tagged alkaline foods, anti-cancer, anti-inflammatory foods, disease, food for health, healing disease, healing foods, healing with food, healthy choices, healthy diet, inflammation, pro-inflammatory foods, Vegan. Bookmark the permalink.